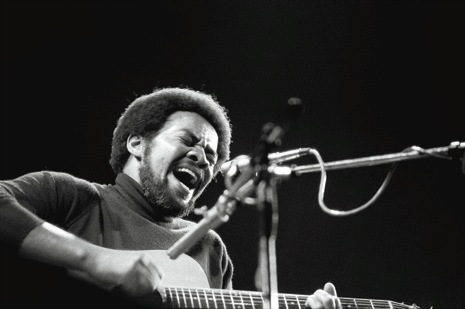 It is almost thirty years since I first heard Bill Withers sing. A friend taped his Greatest Hits album for me and it became the soundtrack of my summer in 1985. His voice, the melodies, lyrics and soulful guitar playing inspired me to search out the music of George Benson, Bobby Womack and early Kool and the Gang (pre pop singles) and their songs have stayed with me ever since. Looking back it strikes me that Withers had to be good, the 1970s was awash with brilliant blues, soul and jazz artists and it required something special to stand out from a very talented crowd. He stood out with simple, beautiful music. In 1971 he won a Grammy for the smash hit Ain’t No Sunshine which reached number two in the US Billboard Chart and he followed it up with a string of classics such as Lean On Me, Grandma’s Hands, Lovely Day and my personal favourite, Use Me, from 1972. Over the next two decades these classics would enjoy re-runs in commercials and soundtracks but like Bobby Womack he never enjoyed the huge success his peers enjoyed, critical acclaim, however, was plentiful. But it’s Ain’t No Sunshine which is the reason for this post. A song which has enjoyed many cover versions, the most notable is unquestionably by Michael Jackson from 1972 but the repeating of the phrase ‘I Know’ some twenty six times in the middle of the song has proved a somewhat predictable choice for talent show contestants trying to prove their prowess as vocalists. Queue the X-Factor and one young man who looks every bit the potential boy-next-door pop star in the making with lovely hair and cheeky smile. He ‘blew everyone away’ with his version, which, having seen it for the purpose of researching this (I promise you!) I have to say it’s not bad. But it’s not great either and if you play the video below and hear a blues and soul singer doing it at the height of his powers then you may wonder the point of it. But these days it’s all about the viewing figures and hits on YouTube is the great leveler, it shows us what the people really want, as disagreeable as that may sometimes feel, and in 2009 Shaun Smith’s rendition on his first X-Factor audition would lead to 23,390,340 views. Quite staggering, and of those one can only wonder how many had heard the original before it? So what about Bill? I thought. How many have bothered to listen to the master show us how it’s meant to be? Well, it would seem that all is not lost! This version below has a total to date of 88,653,509 views! More incredibly however is the fact that 4,500 clicked the ‘unlike’ button, twice those of the young punk, Smith. But I suppose you can’t have it all. Perhaps the real question is how many of those hits were generated by X-Factor fans searching other versions out? We will never know but if it means the original artists receive the recognition they deserve then who cares?